Should Mormons Give Money to Panhandlers? Yes. The answer is: Yes. Instead of addressing the question, the two LDS Living authors grapple with their own issues of middle-class privilege and guilt. Why make this a Mormon question at all? It doesn’t have to be and it isn’t really. However, Mormon scripture, specifically the Book of Mormon, speaks directly to this issue. As a result, Mormons seem to spend a lot of energy justifying their own discomfort with the panhandler. King Benjamin is a Book of Mormon prophet who lived roughly 100 B.C. He delivers a grand oration which covers a number of doctrinal topics. It can be found in the first five chapters of the book of Mosiah. While LDS Living makes passing reference to King Benjamin, the authors clearly have not taken a closer look in quite sometime. And if they have, their articles represent little more than justification for ignoring those very teachings. But I say unto you, O man, whosoever doeth this the same hath great cause to repent; and except he repenteth of that which he hath done he perisheth forever, and hath no interest in the kingdom of God (Mosiah 4:17-18). Whenever I’m approached by someone asking for money, I feel like I am hardening my heart to those in need. But my practical head knows I can’t financially support myself and three people on the street, especially when those people may or may not be honestly in need. What’s a girl to do? My quick fix to the problem was to quit carrying cash so that I could truthfully say that I didn’t have anything to give, easing feelings of guilt from lying or judging legitimate stories. By putting herself in the position of “judging legitimate stories” and by allowing her “practical head,” to win out, Rosner and many people like her have decided to embrace the “natural man” spoken of by King Benjamin earlier in his oration (Mosiah 3:19). “How do I find a balance between wise and righteous judgment and treating people as Mosiah directs?” says Rosner. She seems to have missed the part in King Benjamin which clearly states that this is anything but righteous judgment. If her judgments are wise, then King Benjamin must be foolish. Those that challenge the world are always foolish. To deny the beggar is to deny the Atonement of Jesus Christ. I do not think that this means that we must always give to every panhandler in every situation. There will be times when we actually do not have cash or change on us. There are times and places where we might not feel safe stopping. I understand that. But if, like Rosner, we actively plan not to have money on us so we do not have to lie to the beggar, we are not guiltless. If you do give of your change, you are doing just that. You are doing just a little. A little is still something, but it is not something that we should feel self-righteous about. There are many things that we can do to help those in needy. Ultimately, that is what King Benjamin is talking about. The beggar is just an outward symbol of the needy. I do not see anywhere in King Benjamin’s oration an invitation to choose the wisdom of the world over his council. Instead, he is arguing that we should use wisdom to address the needs of the needy. There is not one answer or one silver bullet. My argument here is not a liberal one or a conservative one. It is also not a private one or a government one. However, if we adopt the attitude advocated by King Benjamin, we might be better able to cooperate one with another. However, as long as we loathe and despise the poor we will never get there. This pride not only puts us at odds with the poor, it puts us as odds with God. “My parents lived in a very modest home…One morning, my mother answered a knock at the door and was confronted there by a large, frightening-looking man, who asked her for money. She said, “We have no money.” There were in that home innumerable children, but very little money. She watched him as he went down the lane through the gate and started up the road. He looked back, but he did not see her standing inside the door, and as he passed the property line, he took the lunch and threw it over the fence into the brush. My mother…was angered at the ingratitude. In that house there was nothing to waste, and she was angered that he was so ungrateful. Well, the young man turned without protest and walked out the gate, and she stood looking after him. It wasn’t until he passed through the gate that she noticed the wagon, the father and mother and the other youngsters, and as the boy swung his long legs into the wagon he looked back rather poignantly; the father shook the reins and the wagon went on down the road. She hesitated just long enough so that she could not call them back. Those who are born-again and belong to God don’t do anything to make sure their sins continue to be forgiven. They don’t do anything to maintain their salvation. Jesus at the cross did everything to ensure the person who comes to Him will never be lost. Jesus is able to save to the uttermost all who call on Him. So he certainly saw the possibility that, without discipline, he himself might fall short of the goal and so be disqualified for the prize. Whenever RealClearReligion shares one of my posts, I know Dave will come by. I would be disappointed if he didn’t. I’ll show you my annual fast offering contributions if you show me yours. Chris, one problem with your understanding of Jannalee Rosner’s statement, at least the quote you gave. Rosner’s judgment seems to involve whether the panhandlers are actually needy, rather than whether their need is a just punishment for their actions. When it comes to giving we are prohibited by Mosiah from making the second call, but not the first. Assuming that are frauds seems to violate the spirit of what King Benjamin is arguing for. We have to make judgements and decisions of some sort. I understand that. However, the idea the panhandlers are swindlers seem rooted in animosity. When is it true belief and when is it an excuse to not give? It is likely to be different for each of us, circumstances differ, but God knows and ultimately He will be the one we answer to. Growing up my mother always taught me to give to those in need. Usually, if I have the time and means I try to offer to buy them a sandwich or something else and see if they accept. However, I see another position as equally consistent with the words of King Benjamin: we have to give, but we are able to give in wisdom and prudence. Especially for our large giving ( not a dollar given to a person on the street), we should ensure that our money does the most good. That might mean giving more as a fast offering, giving to LDS humanitarian services, or giving to local organizations that organize food banks or shelters. Our money should be given prudently rather than haphazardly. I don’t believe most Latter-day Saints would hesitate to assist someone truly in need. Unfortunately our present society is rampant with professional scammers who often make more by holding a cardboard sign than many people earn by showing up for work on time. We generally do not hesitate to help those who are in dire circumstances beyond their control, but struggle to enable those who beg not out of necessity, but out of indolence. “Day after day, homeless and hungry, jobless and stranded, they are begging for your help. So what would you do if the food you generously gave was tossed to the side? What would you think if they appeared to be faking an injury? What would you say if, at the end of the day, a car would be waiting for them to jump in and drive off? There are several examples at the KSL link above, all of which justifiably make people think twice about monetary assistance. I think the story told by Boyd K. Packer is an important one. We can’t possibly always know when someone is truly in need and when they are merely trying to scam us. And many of us struggle in the present economy and cannot just give to everyone whose path we cross, thus we attempt to pick our moments when we can offer assistance. But each of us is responsible to do what we CAN do. If we’re uncomfortable giving money (which is the case with me unless I am familiar enough with a given situation to believe that cash will be used as intended), we can usually offer food. Even a simple Happy Meal is a kind gesture which probably won’t break the bank. I’d rather be giving in some manner and discover later that the beggar was a fraud, than withhold giving and discover later that he or she was in sincere need. This “yes” answer is significantly complicated by the differences between Benjamin’s kingdom and the realm we live in today. 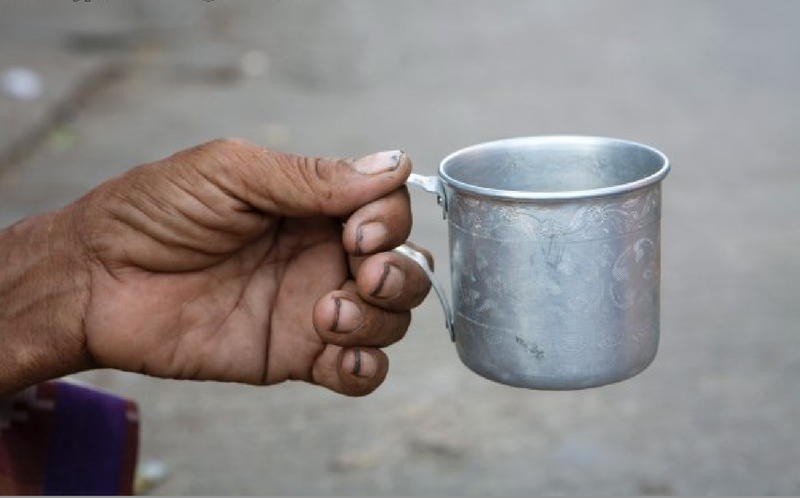 If the difference in judgement amounts to the fact that refusing the beggar doesn’t consign him to perish, or if the person refusing does so because he committed money to institutions which make it a point to seek out and save the destitute, does that change the calculus of refusal? What about the dynamic changed by the fact that methamphetamines exist? If the giving causes that man to perish, rather than sparing him, what of that? From another angle, though, when I think about the fast offering, I can’t equate that completely to what Benjamin was talking about. It’s used to help the poor, but by and large I think it doesn’t have the scope it needs to be that thing. SYMPHONY suggests we give in wisdom and prudence. And surely that is the watchword for “big giving.” But the panhandler doesn’t operate under that umbrella, does he? There’s no way of knowing, no time to be wise and prudent, as I drive up to a busy intersection where someone stands with a cardboard plea. There’s no way of knowing ANYTHING about his reality–drugs, booze, laziness, dependents, PTSD, real need. There is hardly time to fish around for a dollar or two. There! The light’s changed! On we go. I don’t kid myself about the reliability of my little “nudges.” A better idea would be to buy some of those vouchers from a drive-in, or to keep a basket of apples or some nutrition bars in the car. Next time I get a spell of being organized, maybe I’ll try that. What I want to avoid is thinking I’ve solved the problem, or not thinking about it at all, taking less account of the stranger with the cardboard than of the changing light. Thank you for holding up King Benjamin’s sign, Chris.